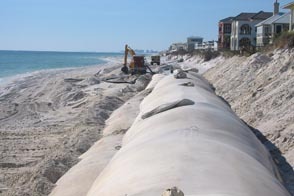 Caribbean GeoTextile Tubes and Bags are an environmentally friendly and affordable solution to Hurricane Storm Protection coastlines, infrastructure and reinforce existing coastal engineered structures. These aesthetically pleasing sand-colored tubes can be filled hydraulically right on-site using sand from the site without having to bear the cost of importing a filler, and placed along shorelines for erosion control. 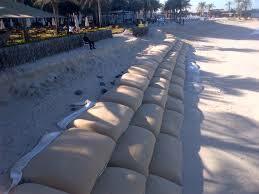 SDMI dba Caribbean GeoTextiles products have the highest UV life span in the industry and their durable rip-resistant fabric minimizes damage caused by debris or vandalism. Because geotextile tubes are actually soft armored structures rather than hardened armor, they are generally easier to permit than hardened structures that have been used in the past such as riprap or concrete. Highly trained engineers can help you choose the right product for Hurricane Storm Protection in Bahamas, Exumas, Caribbean or Central America project. Contact us today for more information on how GeoTextile Tubes and Bags can save you money Hurricane Storm Protection solution for Trinidad and Tobago as well as Belize, Bahamas, Exumas and all of the Caribbean.